I took this picture a couple of months ago. 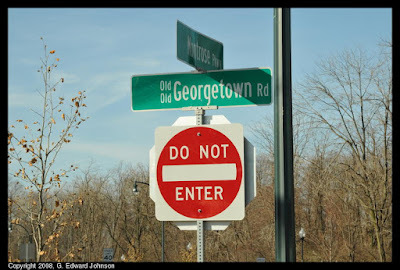 It looks like one of the signs is missing, I gues it didn't apply. 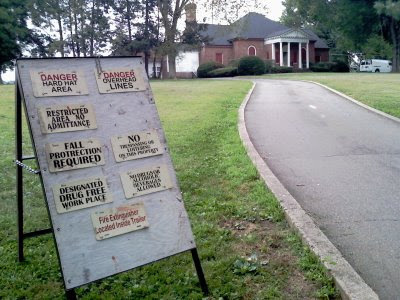 The remaining eight Signs on the sign are: "Danger Hard Hat Area", "Danger Overhead Lines", "Restricted area no atmittance", "Fall protection required", "No tresspassing or loitering on this property", "Designated Drug Free Work place", "No drugs or alcoholic beverages allowwed", "Fire extinguisher located inside trailer"
A few months ago, they took out the perfectly speedbumps on Fernwood Road in Bethesda and replaced them with identical speed bumps. 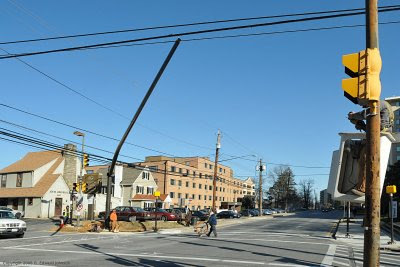 What was the point of that, there was nothing wrong with them (except for their very existance, I'm not a big fan of speed bumps). Yesterday and today they have been doing the unimaginable. 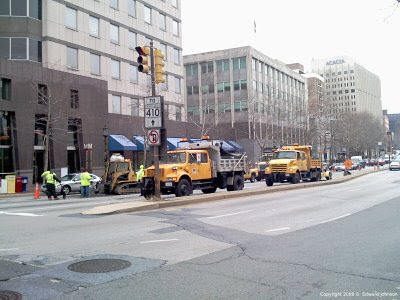 They took out the speed bumps again, and are replacing them with....(wait for it)....speed bumps... that are just like the once they are taking out... you know, the once they just put in two months ago. What are they thinking? In the space of a few months, we have had three sets of speedbumps and there was nothing wrong with the first set. Do they have that much money lying around that they can replace them over and over? Did they forget they just replaced them? I'm not positive, but these new ones might be one inch smaller than the old ones, but is that a good enough reason to remove the whole thing and start over? The presidential elections are coming up quickly and I saw this great bumper sticker. Not sure if it will change my mind about who to vote for. 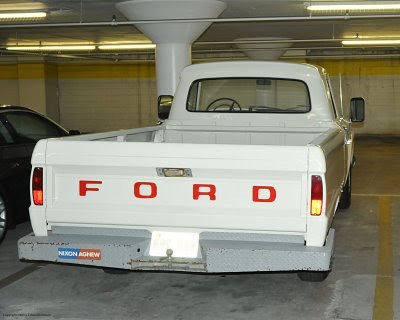 Here is a an old Ford truck with a NIXON/AGNEW bumper sticker on it. I noticed this sign on the loading dock of 3 Bethesda Metro Center Plaza. "Notice. No Trash, No Pallats. 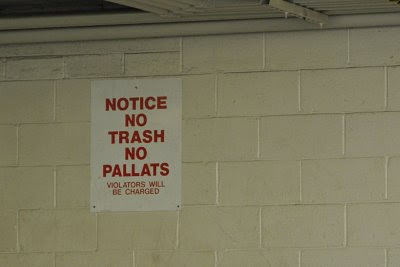 Violators will be charged" Is it ok if I leave pallets there? Does anyone proofread signs anymore? How long has it been there? If managment notices, will they replace the sign or just leave it? Here's another sign on on the same loading dock. It starts "NO PARKING IN LOADIING DOCK. For Unloading Only". What's this, A loading dock where you can't load? Why don't they just call it an unloading dock. And, what if you need to load something, where do you do that? 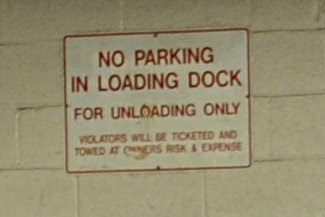 To be fair, there is yet another sign on the loading dock that says you can use it for both loading and unloading. The Dow first closed above 10,000 on March 29, 1999. Here it is again at10,000. Is this what Prince meant when he said "Party like its 1999"? With the DOW crashing down from over 14,000 to below 10,000, I start to wonder where the market is headed. Is now a good time to invest? Will it keep going down? Should I be planning the DOW 5,000 party? Will it just trade sideways for a while? 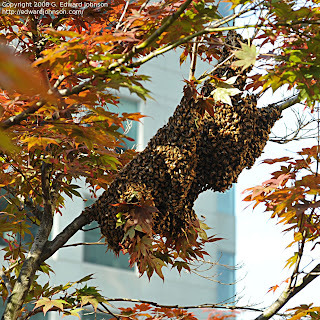 I don't have the answer to any of these questions, but I did a few interesting tidbits. Looking at the DJIA chart I can see that the rate of growth picked up significantly around 1995. In fact, if the rate of growth had stayed the same as it was between 1985 and 1995, we would be around 7,500 now. If the rate of growth had stayed where it was before 1985 then we would be somewhere south of 5,000. Is 7,500 what the Dow "Should" be at? I think that there are fundemental changes to the world economy. Outsourcing has hurt U.S. workers some, but helped U.S. corporations and Indian and Chinese workers. The market largely reflects what is happening to Companies, not people. U.S. companies are more global now too. These things should push the rate at which the stock market increases up a bit. On the other hand, markets tend to go from overly optimistic to overly pessimistic, so they could well go below 7,500 before coming back. The Dow is a pretty poor index to track, the S & P 500 is much better, extrapolating the growth rate from '85 to '95 out to today would give us right around 800, about 20% below where it is now. There are other things to consider. Take a look at the average price to earnings (PE) ratio of the S&P 500, it has fluctuated from below 10 in bear markets to around 20. After 1995 it goes up and peaks above 45. The historic norm is 15 (but the period of 1995 to 2000 pulls up the norm a bit, I think the norm was around 12 pre '95). Figuring out the P/E is a bit tricky, but you can get close by looking at the PE of "S&P Depository Receipts" Ticker symbol SPY. That shows a PE of around 13. Of course, if earnings (the 'E' in P/E) deteriorate, that could push the P/E higher even if prices go down. If we are headed to a P/E below ten like serious bear markets in the past, we still have a ways to go by this measure, but it looks reasonably valued at this point. Another way of looking at the value of the market is by looking at the dividend yield. For a long time, the yield has been going down and is quite low. Way back in 2002, when the Dow was at 8,500, Bill Gross, the manager of the worlds biggest bond mutal fund said the dividend yield of large market indexes need to be 3.5% for the index to be fairly valued. Getting there would result in the Dow going down to 5,000. 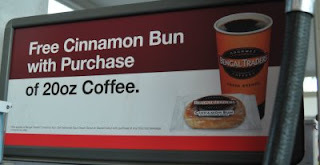 (or companies increasing their dividends). The S&P is currently yielding 2.18%, so by that measure it still looks overvalued, even 8 years after the article was originally written. You can look abroad too, the Japanese Nikkei average closed at almost 39,000 at the end of 1989. Right now it is at 9,200. 18 years after hitting it's high, it is still down over 75%. How is that for depressing. To me, it looks like the market could go down a bit more, but then again, maybe it will go down alot, or maybe it will start going up. Dow 7500 is possible, Dow 5000 seems like unlikely, but I can't rule it out. Looking back in time only tells you past trends, it is myoptic to only consider these. Who knows what will happen next. 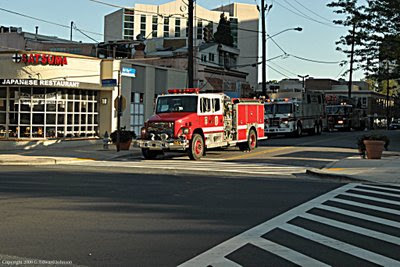 I was driving on Old Georgetown Road on Tuesday and noticed that Del Ray Avenue was closed and there were lots of fire trucks. I took a look around and it seemed like the activity was around 4930 Del Ray Ave. home of the American Gastroenterological Association. (If we were playing scrabble, that would be worth a lot of points). It didn't look like there was a fire, no smoke or hoses, but I counted 9 fire trucks, two rescue squads, one ambulance, a couple of police cars and a couple of other fire-related equipment. 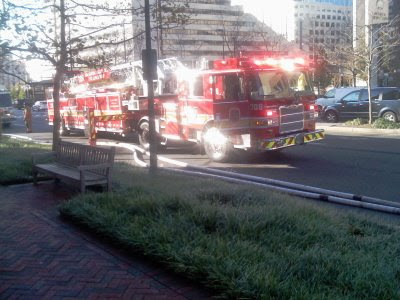 A bit of digging on the BCCRS web site suggests it was a Box alarm for a building of higher than 7 stories. This should bring out five engines, three trucks, one rescue squad, one ambulance, two duty officers. That is pretty close to what I saw. 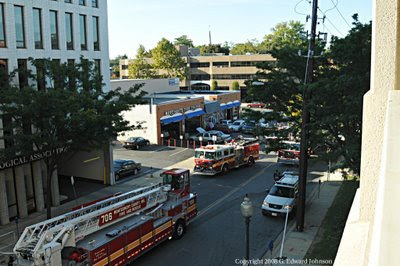 I had to look around the Bethesda Fire Dept website for the definition of a box alarm. As best I can tell, it just means they got an alarm call and this is the pre-planned set of equipment they send to the scene before they know if it is really a fire or not. There is actually a difference between fire engines and fire trucks, fire engines have hoses and pumps, fire trucks just carry equipment. I am not entirely sure, but I think there were 5 engines and 4 trucks there. If you know anything more, post it in the comments. The dow first broke the 10,000 point barrier in March of 1999. There was much celebrating. On October 6, 2008 the Dow Jones Industrial Average crossed the 10,000 point mark again, but this time on the way down. 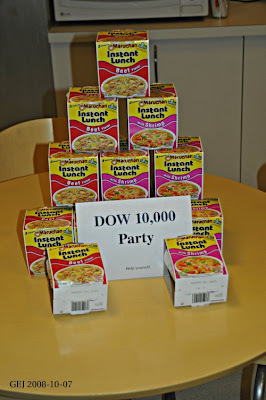 In honor of it closing below 10,000 for the first time in years, the next day we had another DOW 10k party. It wasn't quite as festive. 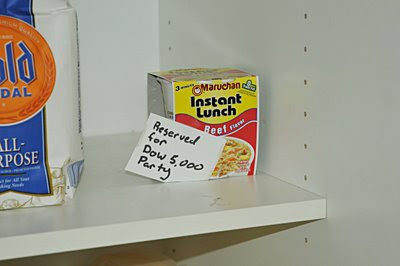 Hopefully we won't have to have a dow 5,000 party. This is reminiscent of when the dow hit 1,000. I looked it up since I don't personally remember it. The dow first closed above 1000 in November of 1972. The last time it closed below 1,000 was in late 1982, a full 10 years later. We are about 9.5 years after the first close above 10000 and it seems likely that we have at least another half year, so we will probably beat the 1,000 record. So far, it hasn't been as bad though, after hitting 1,000 there was a horrible bear market and the dow bottomed at 577. It has been a few weeks since the Parks Half marathon in Montgomery County, and, as I posted earlier, I took a bunch of pictures. I figure now is a good time to reflect on the experience. It was actually more fun than I expected. My expectations were fairly low, I mean, standing in one spot for a couple of hours hitting the shutter button over and over and over isn't high on my list of things to do before I die. Maybe I picked an unusually good spot (right after the tunnel under MD-355) because I saw several runners who were being encouraged by friends and/or family, even a family running together. I also enjoyed the person who started juggling when he saw the camera. I got a good percentage of the people who ran by, but there were many groups of people (more than I expected) and there were sometimes people who's number was obscured the whole time. On the flip side, there were also a couple of people who straightened out their number when they saw me. I was surprised at how good people looked. After 13 miles of running on a very humid day I expected to see more people barely hanging in there, but most people looked like they could keep going a few more miles. After posting the pictures I went hunting for blog posts about the race. I found a few posts. It was interesting to read about the race from people I saw (and in most cases had photographed). One particularly interesting one was by a woman who found out she was pregnant after finishing the half marathon. On the photography side, it wasn't hugely challenging, the hardest parts were trying to make sure that I got a photo of each person in a group, where that person was in focus. Framing wise, I wasn't sure if it would be better to zoom in on a runner, or show a bit more of the surroundings, and if I should take it as a portrait (vertical) or landscape (horizontal). Overall, I think the portrait close-ups came out best, however, if I had a more interesting background they might have come out better (your suggestions are welcome). Swapping memory cards was also a challenge, both getting a new one out while still taking pictures and making sure I didn't run out of space right as a big group went by. Once I got home going through the pictures and adding the bib numbers was a time consuming chore, it took much longer than I thought it would. 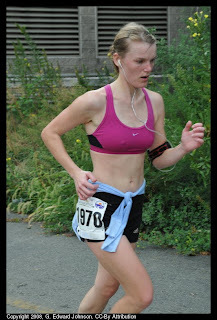 I'm not sure if I will do it again, in many ways I would like to, but the bib-numbering was a huge time sink. I could easily get to the start of the race, take pictures, then drive to the end of the race and take more. If I do it next year I will probably set up before the tunnel so there will be more trees and trail in the background instead of bare concrete. 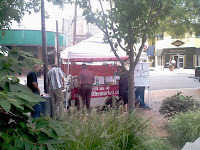 It's that time of year again, Taste of Bethesda is on Saturday, October 4, 2008. If you've never been, you should go. 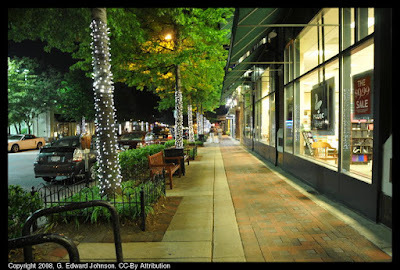 It is a chance to sample food from a bunch of the restaurants in downtown bethesda. 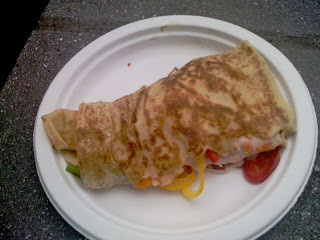 They close off some of the streets in the Woodmont Triangle area and you can buy tickets for samples of the food. They also have free live music and stuff. At the pro and prosumer level, I don't know. I don't have any experience in that area, but I would expect them to have their following. People who are really into pictures use DSLRs and I think people who are really into video will want high quality gear. Consumer video cameras are in for some hurting. The market for them will shrink considerably. Point and shoot cameras will tread deeply into their market. Consider this: Most video cameras today are tape based. when you are trying to tape your kids entire recital, this is fine, it's nice to get the whole thing in one go. However, few people actually do this, and fewer still actually watch these videos. Most videos are short, no more than a few minutes, and tape can be a real drag since it isn't random access. More and more they are going to hard disks or flash memory, giving people random access to their clips. This trend will continue. But let's think here. What other kind of camera uses flash memory, has a nice optical zoom and is taking better and better video as time goes on? That's right, point and shoot cameras. 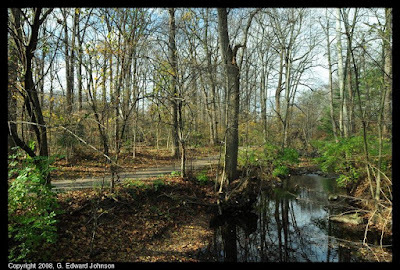 Why take a dedicated still camera AND a dedicated video camera when the still camera can do a decent job at both? The rare times when a dedicated video camera will do better just won't justify their cost, weight, and hassle. Video cameras will continue to increase in resolution. 1920x1080p full HD will be the standard. Their market will be smaller than it is today. Cameraphones have a bright future. Pretty much everyone has a phone, almost all of them have a camera already, so even if people don't use them, they will remain a check-off feature that everyone has. Given this, you can't really judge the success of them as a camera just by sales. The real advantage that they have is that you always have them. You don't have to debate whether or not to take them or make sure you remember to grab it. You just have it. The downside is the picture quality is fairly poor and I don't see that changing a whole lot. The sensor is just too small, and if you make it bigger, then it and the lens take up more space and add weight, both of which are at a premium on phones. the pointless megapixel race will continue 2MP now, probably 4 or 5 in five years. Mostly useless over 2MP and totally useless over 3MP, the quality just isn't there, even in bright light. LED flashes: This will help things a little. More and more phones will get white LED flashes on the camera. 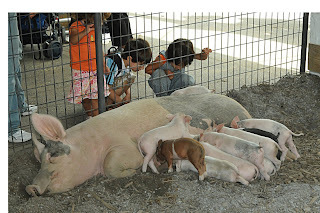 They will actually help a lot of shots where camera phones are used, a group of friends taking a picture from a few feed away, like at a party or sitting around a table at a restaurant. As a bonus, they can be used as a flashlight. Video: They currently have pathetic video (mine does something like 176x144 at 10 frames a second). This will get better, but who knows how much. I think in 5 years, most phones will be doing 320x240 30fps and high end ones will do 640x480 @ 30fps. Phones with real cameras will remain a small niche. There are a couple of them now, with real flashes and zoom lenses. Here's the problem. The bigger camera parts add weight and bulk, and you have to carry them around all the time, even when you don't need the camera. Better to have a smaller, not as good camera with you all the time for those spur of the moment things and bring a point and shoot when you know there will be photo ops. There are some people who carry a point and shoot everywhere, and a camera like this would be an advantage for them, but I doubt that is a huge market segment. Point and shoot cameras seem to be in a dismal spot, with cameraphones eating at them from the bottom and digital SLR cameras pushing down on them from the top. 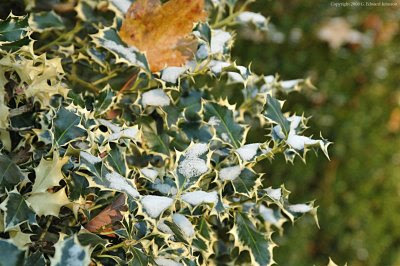 However, think that they will have a strong niche for the foreseeable future. Their growth will probably slow, but they are far from extinct. What's going to save them? Size, picture quality, and video. Picture quality: Seems like an odd strength, given that it is much worse than a DSLR, but instead compare it to a cameraphone. Cameraphones have tiny sensors and tiny lenses, which means that they only take decent pictures in bright light. P&S cameras, with their larger sensors and better flash can take better pictures. Plus, the more advanced feature like face detection work better when you have more processing power to dedicate to them. And Zoom, how many camera phones have a 3x or 4x optical zoom? Size: Seems like an odd strength too. They are much bulkier than a camera phone. You actually have to remember to take them with you instead of always having them around. However, compared to a DSLR, they are much, much smaller and lighter. You can put it in your pocket or bag without it being uncomfortable. Video: Given that we are mostly talking about still cameras, video may seem like an odd strength, but really, it is the point and shoot camera's secret weapon. 5 years ago, they took 320x240 video at 15 frames a second without sound. Now almost all of them take 640x480 video at 30 fps with sound. That means that today's cameras take good enough video that you don't need a video camera for you 30 second to several minute clips. Where will they be in 5 years? Definitely taking HD video, probably at 1920x1080. For short videos they will be perfect. Longer ones will be fine, there will be plenty of flash memory, but I think they will compress things too heavily to do much editing, still, for most people, this will be all they need.